sed -i “1itext to prepend” myfile.txt: -i will update the contents of the file and automatically save it, while 1i will insert to the 1st line of the file. echo -e “text to prepend\n$(cat myfile.txt)” > myfile.txt: the command inside of $(…) is executed before the file is overwritten with >myfile.txt. The -e is to ensure any backslashes in myfile.txt are interpreted…otherwise the command will crash and burn. I’ve recently had to switch by dev setup from Windows+VMWare to working from Ubuntu since I needed to use Vagrant+Ansible, and that dev setup never plays well with Windows. This meant having to go through a new setup and look for alternatives to most of my favourite Windows tools. One of these was Notepad++ I could of course use Wine and emulate Windows, but I felt there was an existing package that can run on Ubuntu without going through Wine. After a brief search on Google, I came across Notepadqq. It’s an opensource (free as in speech) editor for the Linus desktop that has a Notepad++ look and feel. 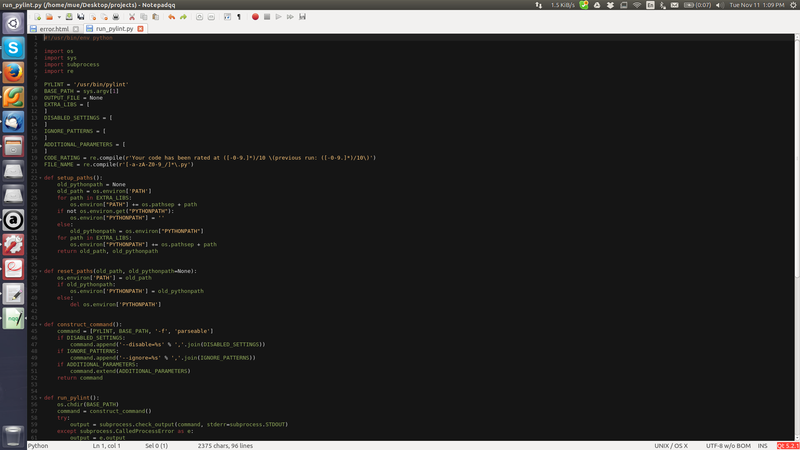 Syntax highlighting for about 100 different languages. Real-time highlighting to find near identifiers in no time.